We are kicking off World Sake Day 2015 at 6:30pm with a Sake Masterclass hosted by sake experts Tengu Sake. There’ll be a variety of sakes to try: different types, styles and regionalities. We’ll also be talking about temperature and food pairings, and there’ll be some nibbles for people to try with the sake. Then, from 7:30pm, the party starts in true PimpShuei style. The collaboration with Tengu Sake means sake both by the glass, straight from the barrel as well as some superb sake cocktails. All this mixed in with PimpShuei’s signature cocktails, retro arcade machines and killer Kung Fu theme. Also present will be Double Dragon Sound Systems on the decks to provide some chilled tunes. A night to remember so come on down for your sake fix! £20 for Masterclass (drinks & nibbles included, free entry to sake party) to book visit Eventbrite (advance booking necessary). 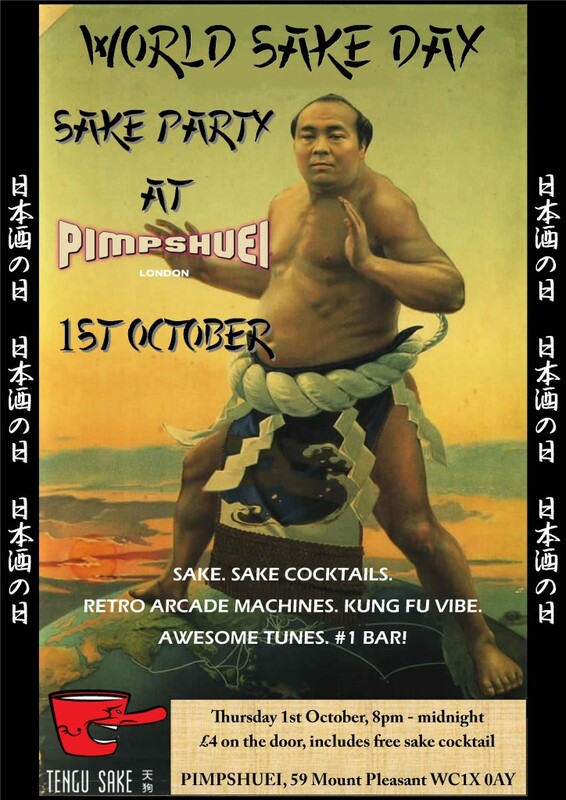 FREE to the sake party – just turn up, you’ll be admitted from 7:30pm.